(CNSNews.com) - Of the 150,272,157 tax returns filed for the 2016 tax year, 50,219,667—or 33.4 percent--were classified by the Internal Revenue Service as “nontaxable returns,” meaning the people who filed them paid $0 or less in income taxes, according to data published by the Statistics of Income Division of the IRS. In 2016, according to Table 2.3, the IRS received 150,272,157 total tax returns. 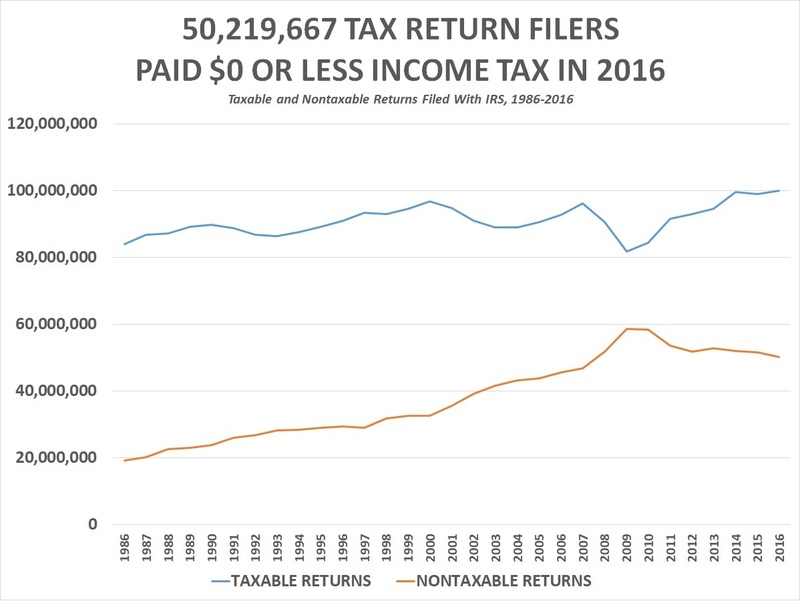 Of these, 100,052,490 were “taxable returns”—meaning the filers paid some income taxes—and 50,219,667 (or 33.4 percent) were “nontaxable returns”—meaning the filers paid $0 or less in income taxes. In the years from 1986 to 2016, the percentage of tax returns that were “nontaxable” peaked at 41.7 percent in 2009, the year the last recession ended. The lowest percentage of nontaxable returns during that same period was in 1986, when only 18.5 percent of all returns filed with the IRS were from taxpayers who paid $0 or less in income taxes. In 2016, according to Statistics of Income Table 1.1, the IRS estimates that it collected a total of $1,446,047,984,000 in income taxes. Of that, $1,157,534,262,000—or 80.0 percent-- was paid by filers with adjusted gross incomes of $100,000 or more. 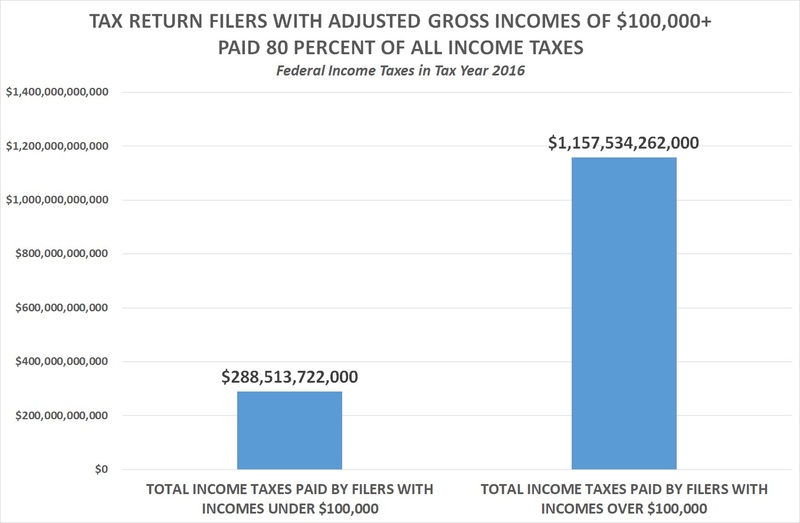 In the years from 1996 to 2016, the percentage of total income taxes paid by filers with adjusted gross incomes of $100,000 or more peaked at 80.5 percent in 2015. In that same period, the lowest percentage of total income taxes paid by filers with adjusted gross incomes of $100,000+ was in 1996, when it was 51.4 percent. In 1996, the IRS estimates it collected $658,244,750,000 in income taxes and that $338,010,561,000 of that—or 51.4 percent--was paid by filers who had adjusted gross incomes of $100,000 or more. Even when dependents who filed tax returns are removed from the data, nearly a third of tax filers still paid no income taxes. The Tax Cuts and Jobs Act that President Donald Trump signed into law in December 2017 eliminated the personal exemption through at least 2025—but it still applied to taxes paid for 2016. In 2016, according to Statistics of Income Table 1.7, 9,383,372 dependents filed income tax returns. Of these, 4,148,923 paid some income tax (totaling $3,663,049,000) and 5,234,449 did not pay any income tax. When dependents and their tax payments are deducted from the national totals for 2016, there were 140,888,785 nondependent returns filed that year. Of these 95,903,567 were taxable returns and 44,985,218—or 31.9 percent of the total 140,888,785--were nontaxable returns, representing filers who paid $0 or less in income taxes. The 150,272,157 tax returns the IRS estimated were filed for tax year 2016 included 54,042,991 jointly filed by a married couple; 3,068,134 filed by a married person filing separately; 21,659,639 filed by a head of household; 71,410,690 filed by a single person; and 90,703 filed by a surviving spouse. “The taxable and nontaxable classification of a return for this report is determined by the presence of ‘total income tax.’ Some returns classified as ‘nontaxable’ may have had a liability for other taxes, such as excess advance premium tax credit repayment, self-employment tax, uncollected employee Social Security and Medicare tax on tips, tax from recomputing prior-year investment credit, penalty taxes on individual retirement accounts, Section 72 penalty taxes, household employment taxes, health care individual responsibility payment, Additional Medicare Taxes, or golden parachute payments. These taxes, however, were disregarded for purposes of this classification, since four of the above taxes were considered Social Security (rather than income) taxes, and the remaining ones were either based on prior year’s income or were penalty taxes. The advance premium tax credit repayment was not an income tax but a repayment of money previously advanced to taxpayers for paying health insurance purchased on a health care exchange. Net Investment Income Tax from Form 8960 was added to income tax after credit to create income tax. “For this report, the earned income credit, American opportunity credit, premium tax credit, regulated investment company, and health coverage credit are treated first as an amount used to offset income tax before credits. Since they were refundable, they were subtracted from income tax (for the statistics) after reduction by all other statutory credits. As a result, some returns became nontaxable strictly because of the refundable credit when the refundable credits equaled or exceeded income tax before credits reduced by any other credits.